Posted in Music | Comments Off on Record Hop Show Tonight! I was waiting for this to happen. It can’t always be good, and I have to say that it is a little refreshing. The funny thing is that when I asked this dude what he thought of the show he had nothing bad to say. I am not endorsing the If you don’t have anything nice to say, don’t say anything at all philosophy, but at least have the conviction to state your honest opinion. Then again we are talking about someone at D Magazine. You can peep the well thought out art criticism here. Posted in Art | Comments Off on It’s about time! Let’s face SXSW is expensive to attend for a lot of people. When it comes down to it, how many shows are you actually going to see, moreover are you going to these shows just so you don’t feel cheated out of your money. So what do you do, when you want to have a SXSW experience but not be out of all your cheddar? You go to SXSW pre-parties. These are the day parties that are not festival endorsed that actually end up getting more favorable press than a lot of the label showcases. In some cases bands that are playing the festival play these to get away from the grind that is SXSW and have some fun. Oh yeah and their free…with comp drinks or ridiculously cheap drinks, which is more than I can say for Austin bars during SX. Here are 2 parties that Art Prostitute has gotten down with and are definitely worth attending. WELL, THE COLD WEATHER HAS ALL MY FRIENDS hiding inside. as if this is some serious cold and ice! i guess we know how to handle heat in DALLAS BUT NOT COLD! A couple noteworthy posts on DALLAS BLOG about the ForwardDallas! plan in the works. Email Providers Set to Charge Some Senders!? I read this article today in the Dallas Morning News which got me thinking about this not so new possibility of charging web postage. It has been a rumor that has surfaced a few times in the past few years. Only this one sounds different because the intent is wrapped up in securing that your email will not be filtered out with incoming SPAM. I hate to hear news like this, just as much as I hate SPAM. It feels like a brainchild of a marketing firm that has been milling over the possibilities of how to slap a charge on each and every email sent ever since hotmail was the rage. First it was the ploy that it was putting the US Postal Service out of work, now this is what’s next…pay so you can get certified email amid all the junk email. SPAM can’t be that lucative. Do people really fall for it? And if so, what’s to stop SPAMers from figuring out ways to send this new certified email? What’s to stop big corporations and wealthy spammers from paying for and sending direct certified email marketing? (…aka…SPAM that has been paid to be sent to your inbox) It’s already sent to your mail box in the form of printed postcards, fake letters, and ad-filled newspapers. Where are all the articles on where SPAM actually comes from? Who is writing it? And how we can stop recieving it? I’d rather pay for an investigation than for certified email. Posted in News | Comments Off on Email Providers Set to Charge Some Senders!? Just the other day I was commenting to a friend how great Myspace makes it for getting the news on all your friends. In this particular case, if one of my friends had not posted that his band was playing, then I would have missed out on their show. It got me thinking about all the ways I, and countless others, have really taken to friend sites in just a matter of a couple years like Myspace and Friendster. Peripheral Media Projects (PMP), formed in 2004, is a group of creators, designers, printers, street artists and activists. Based in Brooklyn, New York, PMP has collaborated with people around the globe. PMP is committed to promoting awareness and social transformation through the creation of events, shows, art, and clothing, both within and outside the gallery and fashion systems. They are a swift, skilled, and focused coalition, open to collaboration with those who want to produce highly creative images via unconventional ideas and vision. Always thinking outside of the box, a unique creation is born from the collective consciousness. Their line of apparel, Plan D Clothing, is printed on the highest quality, ethically-produced, sweatshop-free clothing. They donate 10% of clothing profits to humanitarian, environmental, independent media and anti-exploitative causes. Via collaboration, connection, and the creation of a network of shared skills and resources, they believe it is possible to generate dialogue, strengthen community, and empower individuals to create an unprecedented vehicle for (r)evolution. They believe it is time for the system to change. Adjacent to their production studio, Garrison and Ray helped co-found Antimart, a retail store, gallery, and community space. Antimart promotes people from diverse fields (music, visual arts, fashion, design, literature, film and video, technology, etc.) at the grassroots level, providing a platform for robust, dynamic ideas to be cultivated, nurtured, and manifested. Be a part of the cultural evolution. This is just wrong – a Brookhaven College campus cop car that says “CITY CRIME DIVISION” on the side. 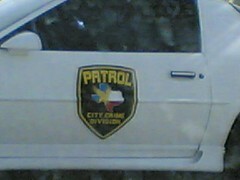 Doesn’t DCCCD have the money to get real cop cars? They should. They have their own taxing district. At the very least, this heap should have the appropriate identifying logo on the side instead of something that runs a close second to that of the police in one of the neighboring cities.